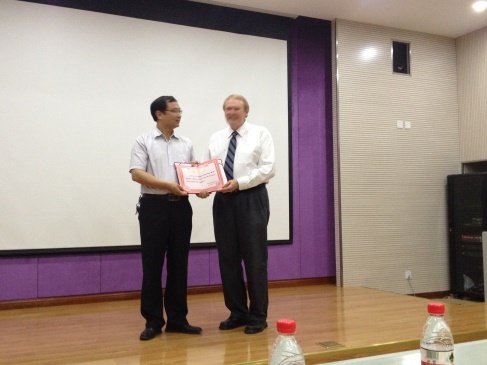 Belmont Professor of Philosophy and Director of Asian Studies Ronnie Littlejohn was named “Concurrent Professor” in the School of Foreign Languages of Zhengzhou University in Henan Province on June 17. Zhengzhou University is the flagship university of Henan Province with over 50,000 students. It is the only one of China’s national “100 key universities” in Henan. Littlejohn has given lectures several times at the university and Belmont’s China trip itineraries have included the campus and opportunities for engagement with its students and faculties since 2010. The “Concurrent Professor” appointment is an honorary recognition of the university awarded to distinguished foreign professors of international reputation. In expression of his appointment, Littlejohn offered the invited lecture, “Confucianism in America,” to a plenary session of Zhengzhou faculty and students.